- MillionYoung at The Empty Bottle with Sunglasses and The Great Mundane - For something synthy, breezy and electro-fied, head to the Bottle tonight to catch Florida's MillionYoung. More info and tickets. -REGO at Double Door with Canasta, Ryan Groff of Elsinore and Nathan Xander - A bill full of standout home-brewed acts equals guaranteed good times. More info and tickets. 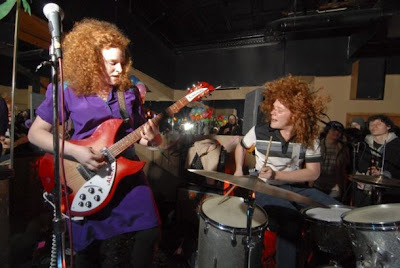 - White Mystery, Hollows, Rabble Rabble and Radar Eyes at Subterranean - If you've been reading this site over the last few weeks, by now you're probably aware of the "Beats and Blogs" show going down at SubT Saturday featuring four excellent bands from our fine city. There will be beats, there will be bloggers and there will be a whole lotta rock, so come on down. Check out this video to learn more and hear from the bloggers. More info and tickets. - Carta Marina at Cal's Bar - Itching for a bit of dive bar action to go along with your live music? Head to Cal's (400 S. Wells) and check out the very cool ambient alt-rock of Chicago's own Carta Marina. To get better acquainted, you can listen to the band's album End of the Era in full on Bandcamp. - As Tall as Lions at Lincoln Hall with Yawn and Apres Vous - After nearly a decade, indie rockers As Tall as Lions are about to pack it in (amicably) and move on to other projects. Chicago fans can say goodbye Sunday night. More info and tickets. Beats and Blogs was tons of fun. White Mystery totally rocks live! By the way, it was nice to meet Andy from Windy City Rock and hope he enjoyed the goody bag. We hope he gave Frank the goody bag we asked him to pass along to him too!